Melbourne pulled off a 17-point gutsy win over Collingwood at Victoria Park in windy conditions in front of 7,728 football fans. Melbourne’s defense was amazing all match and they made it hard for Collingwood’s forwards to get a hold of the footy. The Collingwood women’s team made their debut at Victoria Park and it was the first time both women’s teams played at the iconic ground. Melbourne’s intent was evident early with lots of possessions but they found it difficult when kicking at goal in the tough conditions. Collingwood defended a lot early on and were kept goalless. Both teams were adjusting to the harsh weather conditions in the first term. At quarter time the scores were two apiece. Melbourne continued their dominance with the possession of the football and it paid dividends as they scored two goals late in the first half. Also Melbourne kept Collingwood goalless for the second term. Melbourne co-captain Elise O’Dea booted through the first goal of the match and Melbourne’s first. Tyla Hanks kicked a clever leading banana kick to Lauren Pearce. Pearce kicked the goal truly from directly in front. Collingwood’s Ash Brazill had a huge first half in defense for Collingwood with 10 touches and she was the brick wall that stopped Melbourne from getting more goals on the board. O’Dea was exceptional in the first half with a goal and 18 possessions. At the main break Melbourne had an advantage of 14 points over Collingwood. Neither team was able to break away with clear possession from the ball ups with one stoppage after another in the third term. Great strong tackles applied from both teams in a very contested quarter. At three-quarter time Melbourne were up by 15 points. Paxman kicked nicely forward on her left to Tyla Hanks. Hanks nailed through the goal. Hanks was lively up forward in the final quarter for Melbourne. Brazill kicked the football forward and the football bounced forward to teammate Sarah Dargan. Dargan soccer kicked Collingwood’s first goal of the match late in the quarter. The goal has etched Dargan’s name into the history books at Collingwood with the first ever AFLW goal scored by a Collingwood women’s player at Victoria Park. 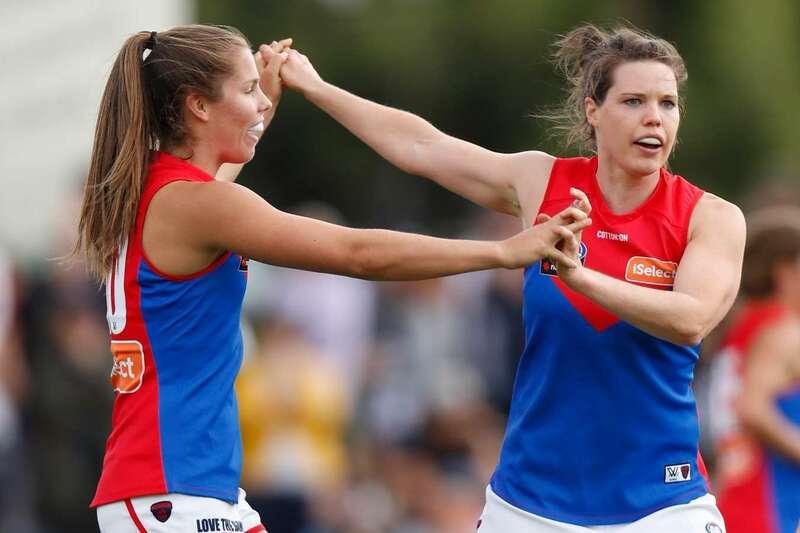 In breezy conditions Melbourne came away with the 17-point win and secured their first win in AFLW 3.0 and unfortunately for Collingwood they remain winless.